The Swedish Army purchased 240 Mk 3’s & 110 Mk 10’s from the British. 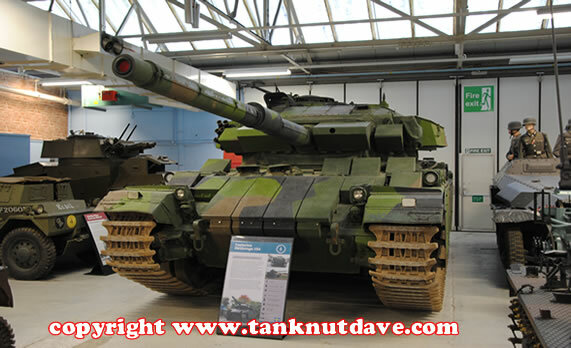 They were subsequently modified for the Swedish Army under designation Stridsvagn, meaning tank in Swedish (AKA Strv). Stridsvagn 105 Stridsvagn 101R Prototype only – upgraded with new suspension, etc. Not built. The last Centurions used by the Swedish Army was the Stridsvagn 104. The 104 was an up-graded version of the Stridsvagn 102. It was fitted with a new diesel engine and transmission together with, among other items, an automatic gear-box. Its armed with a 105 mm main gun, 2 x 7.62 mm machine guns, two six-barrel smoke dischargers and two illumination round dischargers. The vehicle has a standard crew of four – commander, gunner and loader in the turret, plus the driver in the hull. It has an increased top road speed of 50 kph with an on-road & off-road range of 300km & 120 km, with a combat weight of 54 tonnes. The last class trained on the Centurion finished in 2000 on the island of Gotland. The tank is now only in mobilization forces across Sweden. The Swedish Army has now adopted the Leopard 2 S AKA Strv 122.